Summertime is here, along with summer vacation and that means more time outside and having my kids home all day (no school yay!). 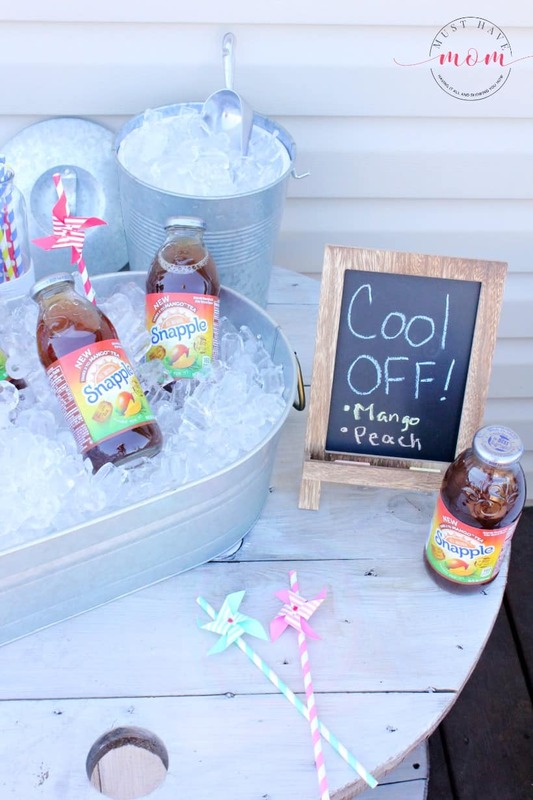 Stay cool this summer with this DIY outdoor beverage station idea! It’s fun and functional and will keep guests cool while you enjoy the sunshine. June 10th is National Iced Tea Day, but who needs an excuse to drink iced tea?! 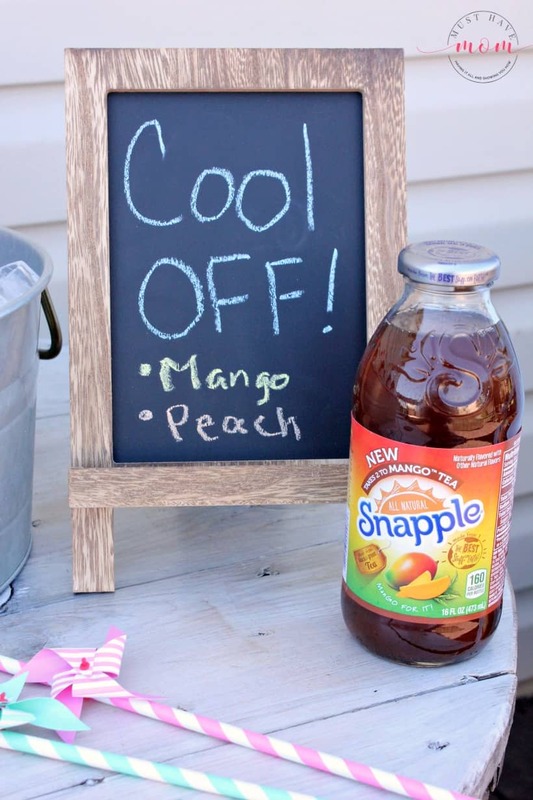 My favorite Iced Tea is the new Snapple “Takes 2 to Mango” Tea. 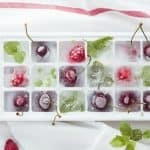 It’s full of all the right flavor combinations to create a refreshing drink that keeps me cool on hot summer days. There is nothing I like more than sitting on the deck watching my kids play. Having this DIY outdoor beverage station nearby keeps me cool and satisfied while I supervise playtime. It’s great for having guests over too. It makes my deck feel so welcoming and hospitable! Did you know that tea is the most popular beverage, next to water, in the world? Thanks to 80% of households drinking tea, we can celebrate National Iced Tea Day together on June 10th! 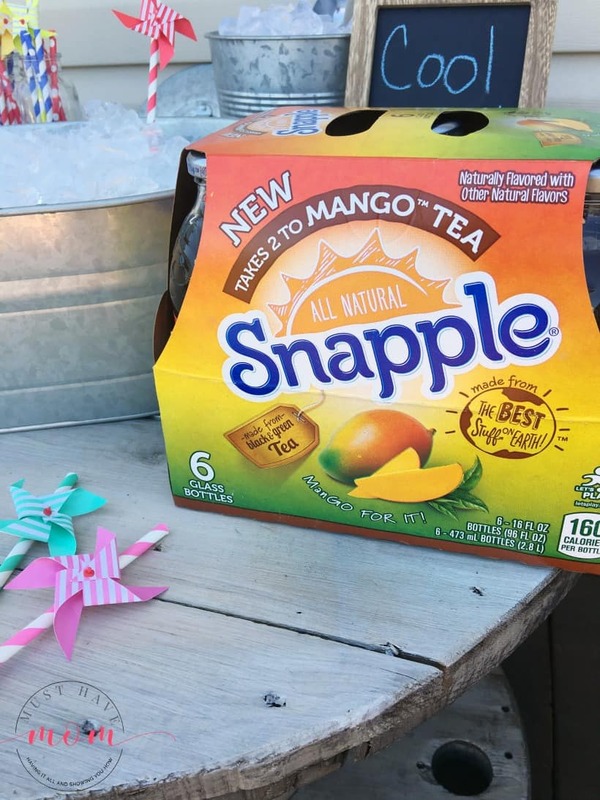 Grab a 6 pack or 12 pack of Snapple “Takes 2 to Mango” Tea, now on rollback at Walmart through July 31st! I picked up a few packs, including my husband’s favorite Snapple Peach Tea, in order to set up my refreshing beverage station. 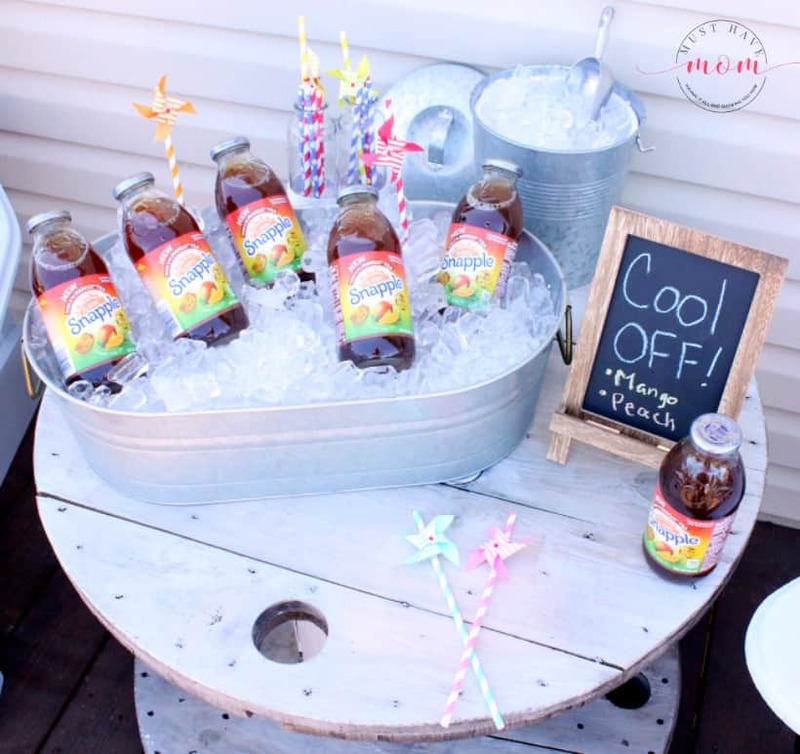 Combine a metal tub filled with ice, with paper straws and whimsical pinwheels to create this farmhouse style beverage station. Add in a chalkboard sign with the flavors listed out and your guests will feel your hospitality shine through! 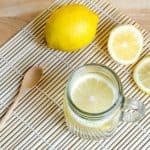 It’s a great way to spoil your family and keep them hydrated too! I found the galvanized metal tub and ice bucket at Walmart as well. They have the cutest selection of metal farmhouse style serving dishes. They are perfect for summer entertaining and creating your own beverage station, not to mention how inexpensive they are! I have practically purchased every piece they sell. Many are sold out but here are some that you can still get your hands on! 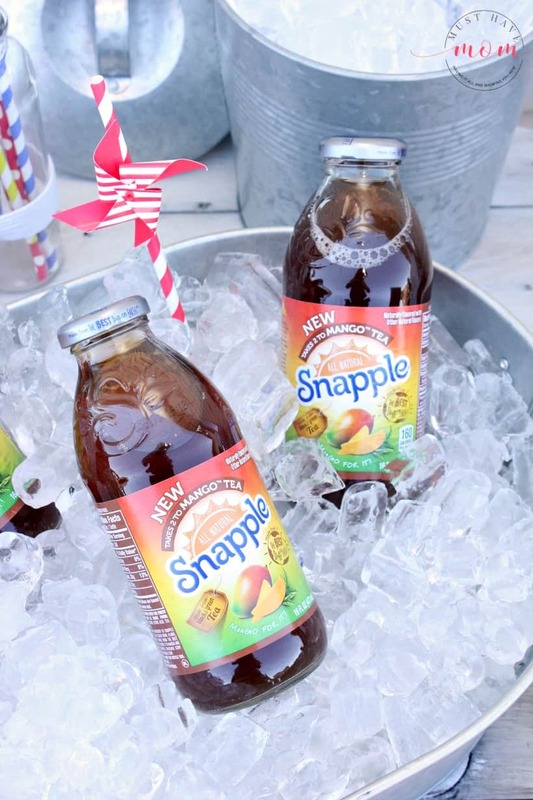 Celebrate National Iced Tea Day with me on June 10th by grabbing your favorite Snapple Iced Tea variety at Walmart! You can find them near the energy drinks and teas (not in the juice or pop aisle). Don’t forget to grab some cute supplies to make your own DIY beverage station! Share your pics with me over on my Must Have Mom Facebook page! I love seeing what you create. 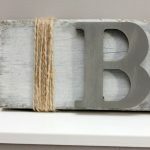 DIY Farmhouse Wood Signs + Me Time For Mom! & $700 Giveaway! That is such a great idea! I love the table made with the giant wood spool, and the chalkboard sign completes the look. I love how simple and classy this setup looks. This would be perfect for a backyard play date when the neighborhood kids are over using the neighborhood swimming pool or a slip n slide. That’s a really nice beverage station. I love this idea. I love drinking Snapple as well. They have a lot of great flavors. That beverage station is a great idea. Especially since it features Snapple which is one of my most favorite drinks ever! Can’t wait to try the new Mango Peach flavor! We are having friends over this weekend for a BBQ. I will have to make an outdoor drink station. It is a great idea. What a great idea! Snapple has always been my favorite drink! 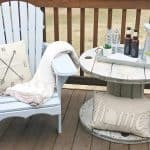 Cute galvanized setup for outside! Perfect for summer! Thank you for sharing on Merry Monday! Have a great week! 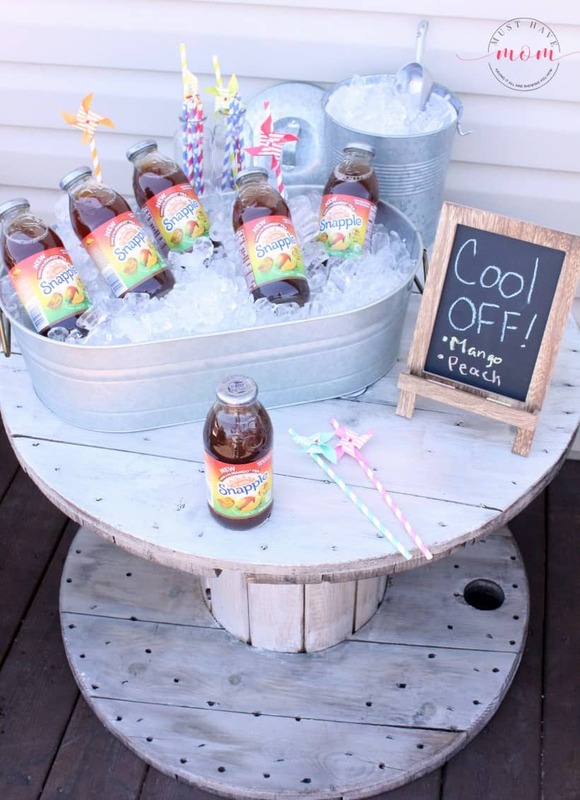 It is such a cute beverage station and the Snapple looks so refreshing. So cute! Love the idea of an outdoor beverage station! Snapple is perfect for the hot weather!